Keeping up with goals this year is turning out to be a bigger challenge than I expected it to be. I normally only set one goal a month so this year with the Scrap Attack challenge and the 6 & 6 in 2018 goals it's been a struggle to keep on track. Even so, I have completed all eight of the goals I've set so far. I'm just always scrambling around at the end of the month to get it all done. What can I say? Life just keeps getting in the way of my fun. The slip I pulled from my Scrap Attack bag for May's goal says to make something from the strings basket. The basket was pretty full at the beginning of the year, but in January I made a small dent in it by making seventeen blocks for Kat and Cat's Covered in Love block drive. 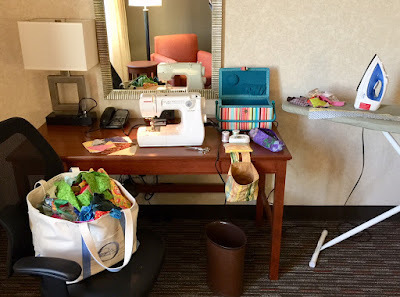 In April I had to spend a few days alone in a hotel room so I took my strings basket along and set up a personal sewing space there. It was like a mini private retreat! ..... and the next night a bunch more. Imagine what I might get done in May in my "real" sewing room! 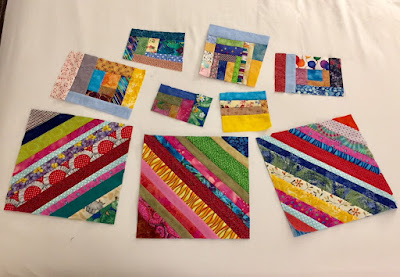 My 6 & 6 in 2018 goal for May is to make a throw sized quilt from batiks. I'm using a pattern called "Hypnotic" from Brenda Henning's "Strip Therapy 2." These two blocks will make an interesting secondary pattern when the rows are put together. Here's hoping that life will settle down a bit, I'll stay on track with my goals, and May will be productive. Especially since June is already shaping up to be a real mess! Those strip sets are so bright and happy! I've not seen the Hypnotic block before, but I agree that it will have some fun secondary pattern(s) as you put it together. I love the hynotic blocks. Can't wait to see the secondary design. Wow, that is definitely dedication to take all your sewing stuff to a hotel to work in the evenings, I'd probably taken some handwork in a small bag, and a book. I really like your Hypnotic blocks, lovely colours and beautifully pressed too. Good Luck with your May goals, you are doing great this year. A mini retreat, all alone in a hotel room - I might sneak off and try that some time. Having your own personal quilt retreat can be SEW productive!! Not to mention peaceful and fun. I did that last year when I went to a conference with my DH. Sewed all day and socialized at night. It was AWESOME! !